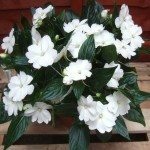 How do I plant New Guinea Impatiens seed? Do they need light to germinate? Or do they need darkness? How deep should they be planted? I want to start them in my greenhouse. Sow seeds in lighting planting medium. Temperatures between 70 and 75 degrees F.
No cover, as light aides in germination.